Guanyin or Guan Yin ~ Perceiving the Sounds of the World. Some Buddhists believe that when one of their adherents departs from this world, they are placed by Guanyin in the heart of a lotus, and then sent to the western Pure Land of Sukhāvatī. Guanyin is often referred to as the “most widely beloved Buddhist Divinity” with miraculous powers to assist all those who pray to her, as is said in the Lotus Sutra and Karandavyuha Sutra. “I didn’t want to think it.” “I didn’t mean to say it.” “I didn’t intend to do it.” How many times have we said these or similar words to ourselves or others? When we entertain unwelcome thoughts, utter words that should remain unspoken, or do what should be left undone, we have allowed our wrong views and afflicted emotions to drag us into committing unskillful acts. When we act (in thought, word, or deed) impelled by attachment, aversion, or indifference, we are living by karma. We are slaves to physical, emotional, and mental tendencies that are, in turn, the product of our previous acts. We are indentured to the past. We are not actors, but re-actors, constantly forced by external circumstances to conduct ourselves in ways we may come to regret. Some are of the opinion that making Vows restricts or negates freedom. However, the ‘freedom’ to be bound by desire, to be led here and there by the dictates of body and mind, is not freedom at all. It is abject submission to mere mood, habit, and circumstance. The Bodhisattvas, on the way to enlightenment, refuse to succumb to the sway of karma. Bodhisattvas are guided by Vows: the intentional adoption of guidelines that align us with the Dharma and advance our spiritual cultivation. To live by Vow —to decide for ourselves what thoughts we will entertain, what words we will speak, and what deeds we will perform— that is true freedom. May I be a guard for those who need protection. A guide for those on the path. those who wish to cross the flood. May I be a lamp in the darkness. A resting place for the weary. A healing medicine for all who are sick. The 37 Practices of the Bodhisattva | Great Middle Way. A.1: Though he sees that in all phenomena there is no coming and going, He strives solely for the sake of beings. To the sublime teacher inseparable from the Lord of Compassion, the Protector of Beings, I pay constant homage with respectful body, speech, and mind. A.2: The perfect Buddhas —source of happiness and ultimate peace— exist through having accomplished the sacred Dharma, And that, in turn, depends on knowing how to practice it. I shall therefore explain the practice of the Bodhisattvas. B.1: Now that I have this great ship, a precious human life, so hard to obtain, I must carry myself and others across the ocean of samsara. To that end, to listen, reflect, and meditate day and night, without distraction, is the practice of a Bodhisattva. B.2: In my native land waves of attachment to friends and kin surge, hatred for enemies rages like fire, the darkness of indifference, not caring what to adopt or avoid, thickens. To abandon my native land is the practice of a Bodhisattva. B.3: When unfavorable places are abandoned, disturbing emotions gradually fade. When there are no distractions, positive activities naturally increase. As awareness becomes clearer, confidence in the Dharma grows. To rely on solitude is the practice of a Bodhisattva. B.4: Close friends who have long been together will separate. Wealth and possessions gained with much effort will be left behind. Consciousness, a guest, will leave the lodge of the body. To give up the concerns of this life is the practice of a Bodhisattva. B.5: In bad company, the three poisons grow stronger, study, contemplation, and cultivation decline, and loving-kindness and compassion vanish. To avoid unsuitable friends is the practice of a Bodhisattva. B.6: Through reliance on a true spiritual friend, my faults will fade and good qualities will grow like a waxing moon. To consider him even more precious than my own body is the practice of a Bodhisattva. B.7: Whom can worldly gods protect, themselves imprisoned in samsara? To take refuge in the Three Jewels, who never fail those they protect, is the practice of a Bodhisattva. B.8: The Buddha taught that the unendurable suffering of the lower realms is the fruit of unvirtuous actions. Therefore, to never act unvirtuously, even at the cost of my life, is the practice of a Bodhisattva. B.9: Like dew on grass, the delights of the three worlds by their very nature evaporate in an instant. To strive for the supreme level of liberation that never changes is the practice of a Bodhisattva. B.10: If all the mothers who have loved me since beginningless time are suffering, what is the use of my own happiness? So, with the aim of liberating limitless sentient beings, to set my mind on enlightenment is the practice of a Bodhisattva. B.11: All suffering, without exception, arises from desiring happiness for myself, while perfect enlightenment is born from the thought of benefiting others. Therefore, to really exchange my own happiness for the suffering of others is the practice of a Bodhisattva. B.12: If someone driven by great desire seizes all my wealth, or induces others to do so, to dedicate to him my body, possessions, and past, present, and future merit is the practice of a Bodhisattva. B.13: If, in return for not the slightest wrong of mine, someone were to cut off even my very head, through the power of compassion to take all his negative actions upon myself is the practice of a Bodhisattva. B.14: Even if someone says all sorts of derogatory words about me and proclaims them throughout the universe, in return, out of loving-kindness, to extol that person’s qualities is the practice of a Bodhisattva. B.15: Even if in the midst of a large gathering someone exposes my hidden faults with insulting language, to bow to him respectfully, regarding him as a spiritual friend, is the practice of a Bodhisattva. B.16: Even if one I’ve lovingly cared for like my own child regards me as an enemy, to love him even more, as a mother loves a sick child, is the practice of a Bodhisattva. B.17: Even if my peers or my inferiors, out of pride, do all they can to debase me, to respectfully consider them like my teachers on the crown of my head, is the practice of a Bodhisattva. B.18: Even when utterly destitute and constantly maligned by others, afflicted by terrible illness and prey to evil forces, to still draw upon myself the suffering and wrongdoing of all beings and not lose heart is the practice of a Bodhisattva. B.19: Though I may be famous, and revered by many, and as rich as the god of wealth himself, to see that the riches and glory of the world are without essence, and to be free of arrogance, is the practice of a Bodhisattva. B.20: If I do not conquer my own hatred, the more I fight outer enemies, the more they will increase. Therefore, with the powers of loving-kindness and compassion, to tame my own mind is the practice of a Bodhisattva. B.21: Sense pleasures and desirable things are like saltwater —the more I taste them, the more my thirst increases. To abandon promptly all objects which arouse attachment is the practice of a Bodhisattva. B.22: All that appears is the work of my own mind; the nature of mind is primordially free from conceptual limitations. To recognize this nature and not to entertain concepts of subject and object is the practice of a Bodhisattva. B.23: When encountering objects which please me, to view them like rainbows in summer, not ultimately real, however beautiful they appear, and to relinquish craving and attachment, is the practice of a Bodhisattva. B.24: The various forms of suffering are like the death of a dream child —by clinging to deluded perceptions as real I exhaust myself. Therefore, when encountering unfavorable circumstances, to view them as illusions is the practice of a Bodhisattva. B.25: If those who wish for enlightenment must give away even their own bodies, how much more should it be true of material objects? Therefore, without expectation of result or reward, to give with generosity is the practice of a Bodhisattva. B.26: If, lacking discipline, I cannot accomplish my own good, it is laughable to think of accomplishing the good of others. Therefore, to observe discipline without samsaric motives is the practice of a Bodhisattva. B.27: For a Bodhisattva who desires the joys of virtue, all who harm him are like a precious treasure. Therefore, to cultivate patience toward all, without resentment, is the practice of a Bodhisattva. B.28: Merely for their own sake, even those who long for liberation make efforts like one whose hair is on fire. Seeing this, for the sake of all beings, constant effort, the source of excellent qualities, is the practice of a Bodhisattva. B.29: Knowing that through profound insight, thoroughly grounded in sustained calm, the disturbing emotions are completely conquered, to practice the concentration which utterly transcends the four formless states is the practice of a Bodhisattva. B.30: In the absence of wisdom, perfect enlightenment cannot be attained through the other five perfections alone. Therefore, to cultivate wisdom combined with skillful means and free from the three concepts is the practice of a Bodhisattva. B.31: If I do not examine my own defects, though outwardly a Dharma practitioner, I may act against the Dharma. Therefore, continuously to examine my own faults and give them up is the practice of a Bodhisattva. B.32: If, impelled by negative emotions, I relate the faults of other Bodhisattvas, I will myself degenerate. Therefore, to not talk about the faults of anyone who has entered the path is the practice of a Bodhisattva. B.33: Offerings and respect may bring discord and cause study, contemplation, and cultivation to decline. Therefore, to avoid attachment to friends and benefactors is the practice of a Bodhisattva. B.34: Harsh words disturb the minds of others and spoil my own practice. Therefore, to give up coarse speech, which others find unpleasant, is the practice of a Bodhisattva. B.35: When emotions become habitual, they are hard to counteract with antidotes. Therefore, with mindfulness and vigilance, to crush attachment and other negative emotions the moment they arise is the practice of a Bodhisattva. B.36: In short, wherever I am, whatever I do, to be continually mindful and vigilant, asking, “What is the state of my mind?” and accomplishing the good of others is the practice of a Bodhisattva. 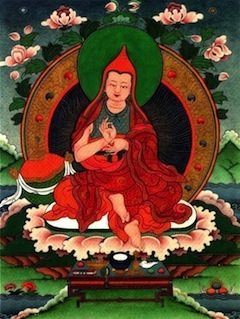 B.37: Dedicating to enlightenment through wisdom purified of the three concepts all merit achieved by such endeavor, to remove the suffering of numberless beings, is the practice of a Bodhisattva. C.1: Following the teachings of the holy beings, I have arranged the points taught in the sutras, tantras, and shastras as The Thirty-seven Practices of the Bodhisattva for the benefit of those who wish to train on the path. C.2: Since my understanding is poor, and I have little education, this is no composition to delight the learned; but as it is based on the sutras and teachings of holy beings, it is genuinely the practice of the Bodhisattvas. C.3: However, it is hard for someone unintelligent like me to fathom the great waves of the Bodhisattvas’ activities, so I beg the forgiveness of the holy ones for my contradictions, irrelevances, and other mistakes. C.4: Through the merit arising from this and through the power of the sublime bodhichitta, relative and absolute, may all beings become like the Lord of Compassion, who is beyond the extremes of samsara and nirvana. when others are sharing anger. We are not here to change others. to be joyous, fearless and trusting. the illusion of “other” dissolves. I shall repeatedly take Refuge, recollecting the qualities of the Three Jewels. I shall make daily offerings to the Three Jewels of all I eat, drink, or otherwise accept. I shall not forsake the Three Jewels, even at the risk of my life. Having taken Refuge in the Buddha, I shall not take refuge in lesser beings. Having taken Refuge in the Dharma, I shall not harm sentient beings. Having taken Refuge in the Sangha, I shall not rely on those with wrong or lesser views. I shall honor and respect the Buddha in every representation. I shall honor and respect all Dharma texts. I shall honor and respect the Sangha of the Bodhisattvas and the ordained. I shall not take life. I shall not take what is not given freely. I shall not engage in sensual misconduct. I shall not lie or speak harsh words. I shall avoid intoxication leading to heedlessness. I shall not rest on elevated seats and beds. I shall not eat improper foods at inopportune times. I shall avoid adornment and mindless entertainment. I shall awaken numberless beings. I shall end inexhaustible delusions. I shall open boundless Dharma gates. I shall become the Great Middle Way for the benefit of all. I shall not praise myself or denigrate others. I shall not withhold material aid, protection, and the Dharma from those in need. I shall not resent and punish the transgressions of others. I shall never abandon the Great Middle Way. I shall not usurp what belongs to the Buddha, the Dharma, and the Sangha. I shall not disrobe the ordained under my care. I shall not destroy the dwellings, property, or livelihood of others. I shall not hold wrong views regarding the Noble Truths, karma, rebirth, and emptiness. I shall not teach that which is beyond another’s capacity. I shall not undermine another’s faith. I shall not cause others to regret or abandon skillful vows. I shall not disparage the preparatory teachings of the Dharma. I shall not claim sublime attainments for myself. I shall not exploit the generosity of others. I shall not favor the lesser with gifts meant for the great. I shall not give up the Supreme Aspiration. I shall respect and serve my Root Teacher with body, speech, and mind. 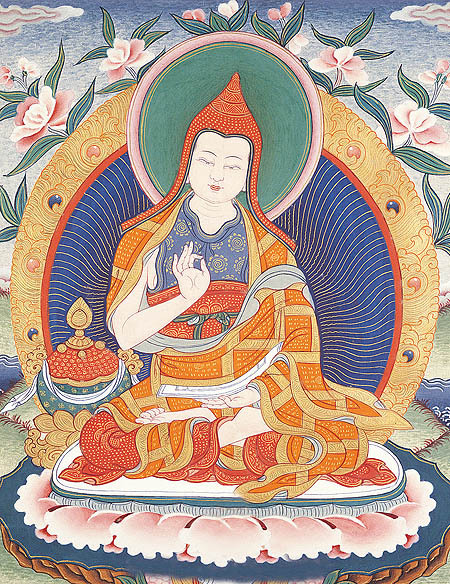 I shall respect and obey the precepts laid down by the Buddha and the Jonangpa Masters. I shall respect and support Vajra brothers and sisters. I shall cultivate certainty in Buddha Nature. I shall cultivate and sustain love for all sentient beings. I shall never abandon or exclude a single sentient being from my compassion. I shall study, reflect, and meditate on Other Emptiness. I shall prioritize spiritual practice, without distraction. I shall avoid intimacy with those inimical to the Dharma, and seek their correction. I shall transmit only the authentic Great Middle Way, without fear or calculation. I shall transmit the teachings only after receiving explicit authorization. I shall sustain body and mind, without attachment or aversion. I shall never despise or refuse rebirth as long as sentient beings remain. In short, I shall conduct myself in such a way as to sustain and increase the faith of the faithful and gladden the hearts of all sentient beings. Are, like me, all one in wanting happiness. Because I cling and take it for my own. Their suffering is mine and therefore hard to bear. For it is simply pain, just like my own. For they are living beings, like my body. In Dharma traditions, and especially those associated with the Mahayana, or Great Vehicle, ‘Engaged Buddhism’ is not a new trend, whether in its social or environmental manifestations, but has been always present. The ideal of the Bodhisattva, the Noble Being, is to attain enlightenment for the benefit of all, human and non-human, and thus service is the supreme expression of bodhichitta, or the mind of enlightenment. Beings are numberless. I vow to save them all. Delusions are inexhaustible. I vow to end them all. Dharma gates are boundless. I vow to open them all. The Great Middle Way is unsurpassable. I vow to become it for the benefit of all. Bodhisattva Prayer | Great Middle Way. for those who need assistance, may I be their servant. and for every being the abundant nurse. may I be their ground and sustenance.